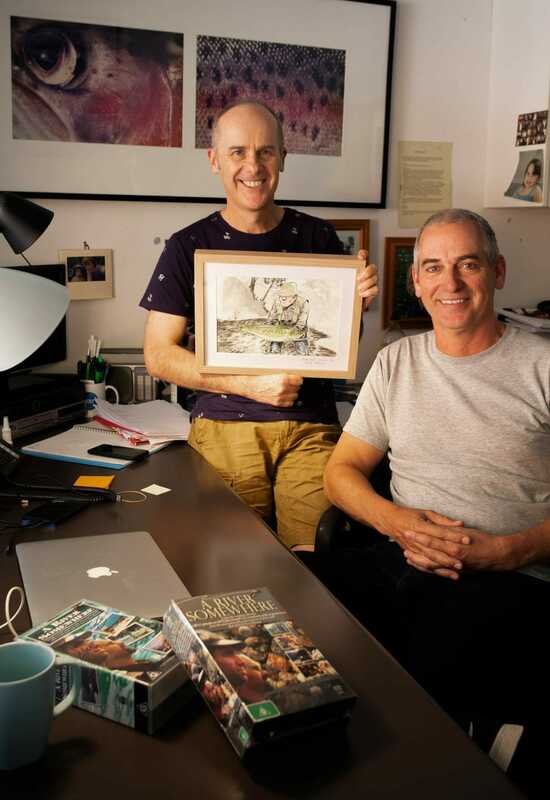 Published in FlyLife Issue 92, this is the extended full interview by Bill Bachman with Rob Sitch and Tom Gleisner. 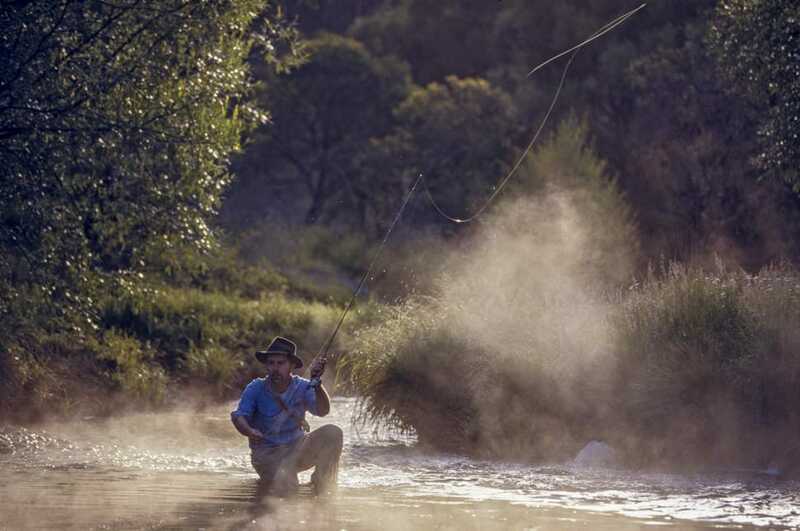 A River Somewhere, once described by Rob Sloane as ‘a landmark in the fly-fishing lives of many FlyLife readers,’ first went to air on the ABC in 1997 and 1998, in two series comprising 13 half-hour episodes. 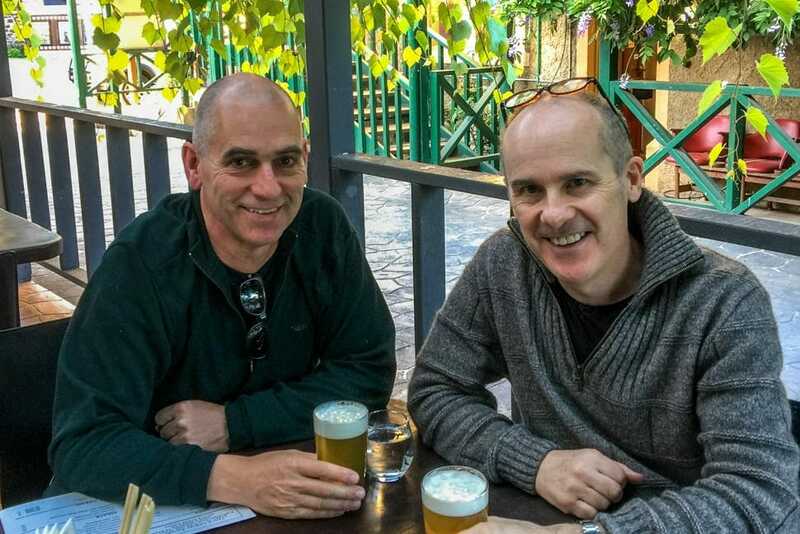 To mark this 20-year anniversary, back in August 2016 Bill Bachman planned to spend a day with Tom Gleisner and Rob Sitch where it all started, on the Howqua River in northeast Victoria, catching trout and telling campfire tales. This turned out to be more difficult than anyone imagined, and it took until March 2018 for the three to get together… around a conference table in the Melbourne offices of Working Dog Productions. FL – How come it has taken us this long to get together and why it is so hard to find the time to go fishing? Rob Sitch – I have a theory that when you’re 30 and single you can get together in an hour, but when kids are involved and you’re trying to coordinate multiple diaries, the success rate is inverse-exponential. Tom Gleisner – Then throw in the vagaries of weather and so on, and it’s pretty easy for everything to go out the window. FL – for the benefits of readers who may not be familiar with your work, what sort of things have been keeping you busy? RS – Well, a variety of projects really. Have You Been Paying Attention? is now four or five years old and currently airs in prime time on commercial television and takes up 30 weeks every year. When we start work on that some of the autumn leaves are still on, and we don’t finish ‘til three weeks after Melbourne Cup. TG – Plus we’ve done three series of Utopia for the ABC, which we start writing and producing as soon as Have You Been Paying Attention? winds up. And we’ve just finished shooting another series of Russell Coight’s All Aussie Adventures, so any potential downtime last year was sucked up by that. We tend to have a show on the screen, a show soon to come on the screen and then something bubbling along in the background, and that seems to fill up most of the gaps in our lives. RS – And we’ve always got to remind ourselves that we’re parents, which doesn’t leave a lot of time for fishing. FL – Looking back to when you obviously did have more time for fishing, how did A River Somewhere originate, whose idea was it, and how closely did the series mirror the original concept? RS – That’s interesting…I’m trying to remember. I guess as TV people, we often think about what would make a great series. And that’s often because what’s currently out there doesn’t service the ideas in your head. We probably thought the anticipation and experience of heading up into isolated places – combined with fly fishing, which is a very evocative pastime – might be a good basis for a show. You’re never sure, so we went and did a test, and when we started showing elements of the test to people, they sort of responded in the way we’d intended. FL – The series actually spoke to three different audiences in a way, didn’t it? I recently went back and watched the first series again, and it occurred to me that you really anticipated several genres that have become much, much bigger since then – one being travel and the other being cooking. Food in particular really wasn’t much of a genre on TV in those days and now of course it’s huge. TG – That’s true. 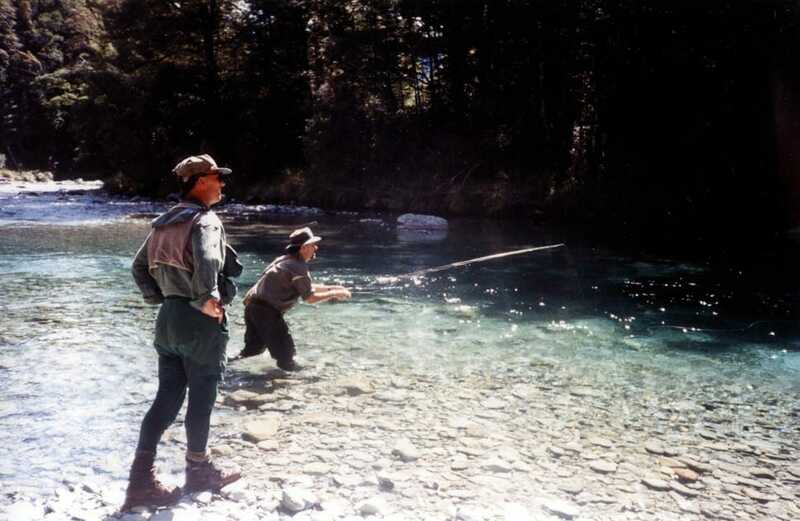 I seem to recall clearly that the series was motivated because Rob and I had taken up fly fishing and were really enjoying it, even though we were very much in the rudimentary phase. But we were baffled as to why the fishing shows – some on video, in those days, or on TV – just didn’t interest us. We loved this pursuit but were curiously disengaged by the offerings that were out there, so we began almost with a list of things we didn’t like and from there did a test. Pretty much every program we’ve ever done started that way, from A River Somewhere all the way to Utopia. FL – A lot of the things you’ve done have broken the mould or created a new mould, and this is a good example, because out of this has grown a whole range of catch-a-fish-and-cook-it type shows and mild-mannered off-the-beaten-track adventure shows. RS – I definitely think there’s a human instinct, especially if you’re male, to have some outdoor or camping or survival skills. Having been devoid of them probably until I turned 30, I suddenly realised the fun of learning those skills. 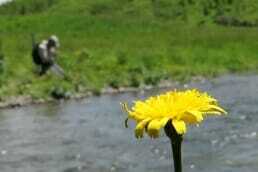 To us anyway, it seemed almost primeval to walk up a river and catch a fish to eat. I also think the feeling of being in a vast place, with no modern or Western amenities, is quite addictive. FL – Would it be fair to say you did a lot of that learning on camera? After all, your DIY approach was pretty low-tech and much of the humour was self-deprecating. TG – There were probably two reasons for that. One, we would have been frauds if we’d carried on like veterans with forty years’ experience, but also we felt we didn’t want this to be a series where we were telling people what to do and what not to do. We thought people would be far more interested in coming along on the journey if we didn’t adopt that sort of tone. RS – I think that ended up being important. Tom had a saying that learning to fly fish is not like learning to play the piano. The point at which you enjoy it is not after seven years of practicing scales. We didn’t want to be dishonest about the fact that even at a rudimentary level, fly fishing is bloody brilliant. For a start, kits have become cheap. In the old days I think you almost needed to own a Western District property to have the right to fly fish, whereas now for one or two hundred bucks you can get going. I reckon a big change came along when Rex Hunt started making fishing silly and fun and open to everybody to be enjoyed in whatever way they wanted. It felt like fly fishing was ready for that too. Rob Sloane once said that you fix things in generations, and [things havechanged since those days]. The current generation has more extreme instincts. They think nothing of hiking for four days to chase a brook trout in the middle of a snowstorm. I think that idea of ‘don’t take too long to get going’ – and of having fun – was aided by the fact that we were amateurs. FL – How did you talk the ABC into screening the series in prime time? RS – I think at the time it was odd enough and interesting enough, and it was only half an hour. The first time it went to air it rated really well and the whole series went on to rate really well. That’s one of the benefits of television – there’s a pretty strong feedback loop. We still fish, we just don’t take a film crew with us anymore. 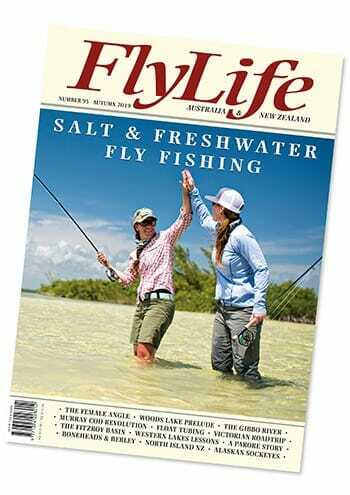 FL – Does fly fishing still play a part in your lives? TG – Very much. We still fish, we just don’t take a film crew with us anymore. Yes, life gets in the way, but Rob and I usually get away for a trip sometime in December when things start to wind down at the office. The South Island of New Zealand is a particularly happy hunting ground for us, and I think we’ve barely scratched the surface there. And we still return to northeast Victoria when we can. FL – Where was the last place you fished? RS – We went into the upper reaches of the King, just before Christmas. We were amazed to find a little tiny stream off the side that was just full of trout. FL – A couple of years ago a guide took me up a little mountain stream called Elkhorn Creek, running into the Gallatin River near Big Sky in Montana. It was small and steep but each tiny pool held the most gorgeous little trout. It was like fishing in Tiffany’s, every cast produced a jewel. RS – That’s very interesting. 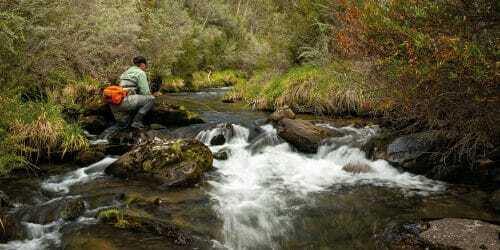 I love the way fly fishing makes a fool of you, in a great way. You think that catching bigger and bigger fish is going to scratch an itch, but once you’ve climbed that mountain and come down the other side you find – or at least I have – that no fly rod is light enough or small enough. The last rod I used on one of those streams was a 0-weight. We had a 2-weight but that wasn’t light enough. 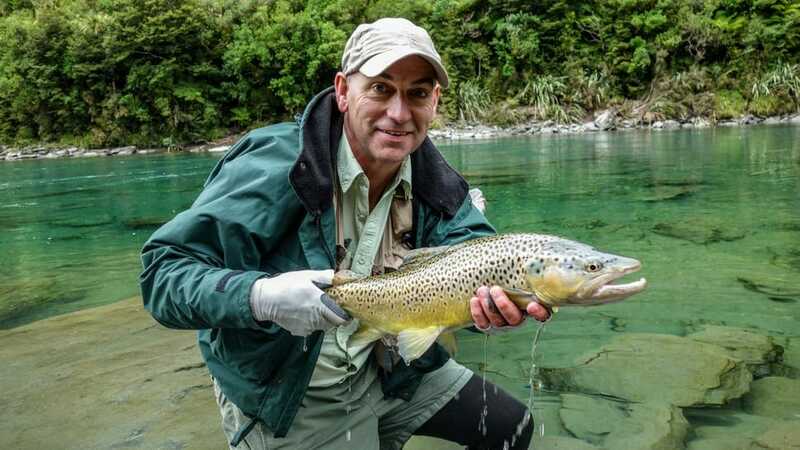 It’s curious that so many people think the greatest joy they will ever have is catching a 10-pounder on the west coast of New Zealand, yet strangely, getting a hundred and fifty gram, beautifully coloured mountain brown trout …. FL – ….that fits in the palm of your hand. RS – ….yeah, with a 0-weight rod in a little tunnel of blackberries is often more fun. FL – When you’re out fishing, does anyone ever recognise you and want to talk about the series? Have you ever been followed by paparazzi in waders? That’s happened to us a lot. I’d say we’ve probably done about ten different TV shows, but A River Somewhere is unique in the way people speak to us about it. Often it’s a guy, who says the show was more than just entertainment, but also about friendship and having time away from it all. I saw a study the other day that said anticipating a holiday is as enjoyable as the holiday itself, and fishing is like that. FL – Anecdotally we also know that the series inspired not just men, but also women and young people to have a go at fly fishing. Would it be safe to say that your rather homespun approach allowed many ordinary people, many of them non-anglers, to relate to your adventures? And in some cases, to take up fly fishing themselves? RS – Yeah, I think so. When you watch pro golf you are reminded immediately of the distance between your game and theirs. When you watch us, you think, surely if those guys can do it, I can do it, I can have that enjoyment too. FL – And also, on a bad day on the golf course or a bad day on the stream, you’re still in a beautiful place. RS – True in both cases, and that’s very important – trout seem to have a predilection for beautiful places. RS – (laughing) I’d forgotten that – it was one of Tom’s lines. TG – One of our greatest pleasures when we’re out fishing and not being successful, as often can happen for long stretches, is the speculation. You come up with all these great theories. They generally involve a barometer, or the water being a little bit off clear from rain that fell in the headwaters two days ago. You can spend an hour following these theories and still not catch any fish, but it’s entertaining. 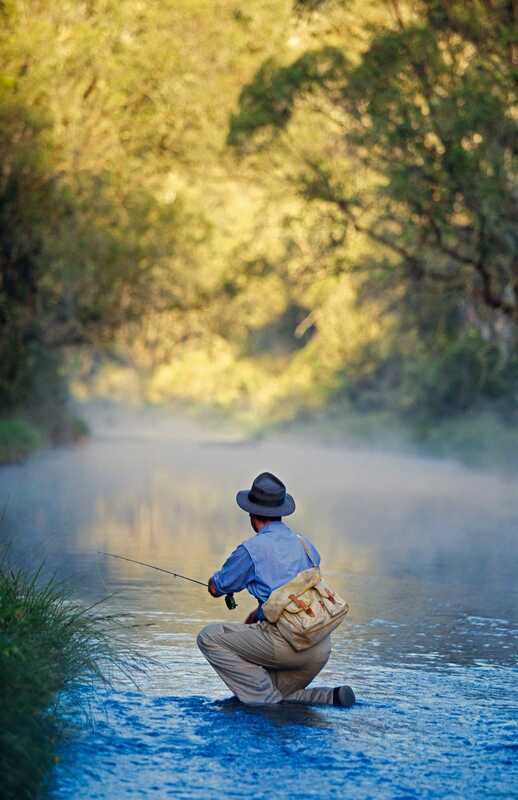 RS – I’m sure fly fishing has more theories than any other sport. We joke about it – we were up the King the other day and said “OK, how long ‘til the first theory?” and it was only 15 minutes. It’s funny how science allows us ever greater insights into our rivers and how and why they change, but apart from maybe the barometer it has remained curiously useless for our sport. FL – What about equipment? RS – Tom has a theory that there are equipment sports and non-equipment sports. Having a love for an equipment sport is the gift that keeps on giving, or more correctly the cost that keeps on costing. 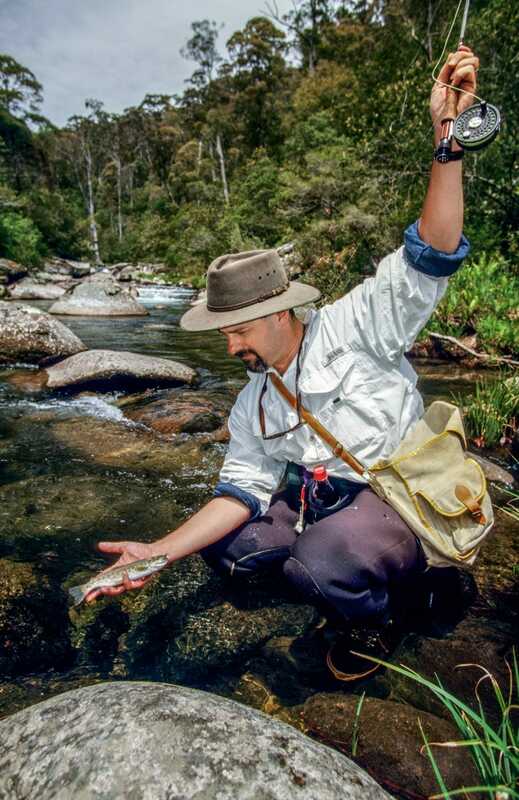 The kit in fly fishing is incredible, and it keeps getting better and more interesting. I guess there are other sports like that, say, I don’t know, road cycling, but if you take up squash, once you’ve bought your racquet and a water bottle that’s about it. FL – Yet one of the things that came across very strongly in the series is your low-tech approach to the whole thing. 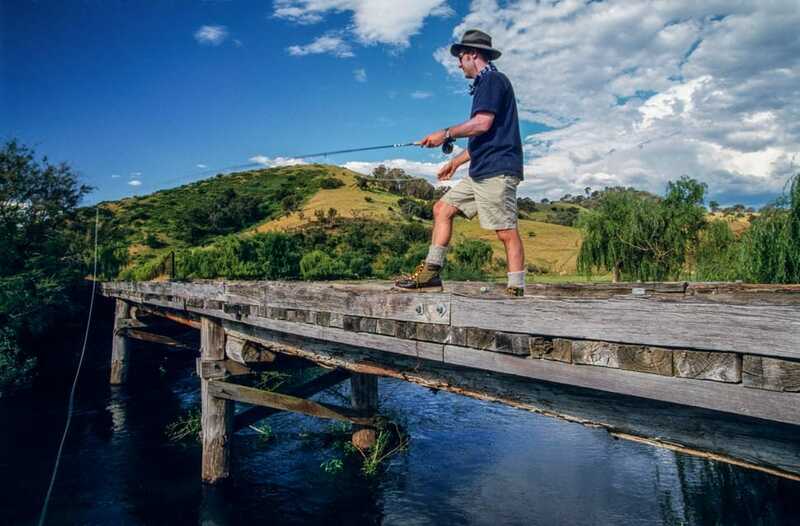 When did you see another fishing series that featured worn-out Blundstones, Dunlop Volleys or Snowbee neoprene hip waders? RS – (laughs) Well, yes. I changed my fly vest the other day for the first time in about a quarter of a century and found sandwich wrappers in the old one that must have been left over from our filming days. FL – Have you upgraded some of your gear since those days? 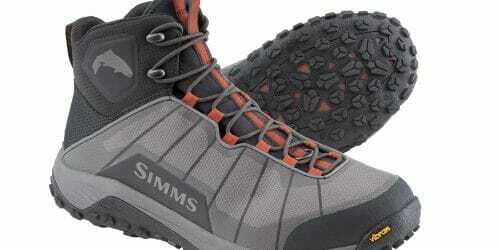 Have you kept up with the changes in fly fishing technology? TG – I’m not really aware of too much change. I still use the same reel my wife gave me 30 years ago. 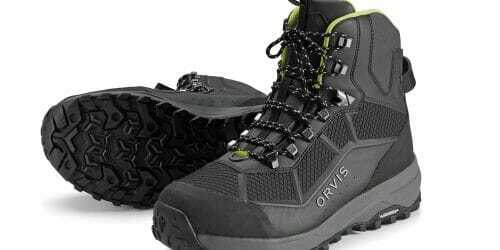 Wading boots maybe – Rob got a slightly lighter pair some years back that I’m increasingly envious of, but really…. FL – So do you reckon people overdo the gear thing? RS – The entire golf industry is based on the misconception that slightly better technology is going to improve your golf swing. And it’s not. Still to this day, it’s the deception and the quality of the cast and being in the right place that gets the fish. But I still think there’s something delicious about modern kit. And I’ll even add bamboo rods into that. Again, once you’ve climbed up the [hi-tech] mountain and gone down the other side, you can start stripping away the modernity, and that’s fun too. Slowly over the years I have accumulated a rod in every weight class, and yet one of my original fibreglass rods from 30 years ago is still great to fish with. FL – Rob Sloane tells me there are still FlyLife readers who are working their way through your list of fishing destinations, rather like twitchers with their life list of bird species. When you finally got to the end of Series 2 did you still have a few places you wanted to go? RS – Yeah, we did. Sadly we couldn’t go to a few of them because of civil wars breaking out and stuff like that. We were going to go up into the upper reaches of Kashmir and then two nuclear-armed states decided to dispute that territory, so it all became too hard. That was one. TG – Another was a person who contacted us from Tehran telling us about all the good fishing in the snow-capped mountains of Iran, but we didn’t follow that one up either. Sorry to quote the series punchline, “there’s always a river somewhere” but there’s another ten series of rivers somewhere. We simply ran out of time and got caught up in other projects. RS – The highlands of New Guinea is another one. FL – There seems to be a lot more pressure on the rivers I fish in northeast Victoria than there used to be. Do you think the series had anything to do with that? TG – I think that was just inevitable as a result of population increase and people taking up more outdoor sports in general. RS – You don’t want to [be guilty of] locking the gate just after you’ve gone through. I think we were conscious of that and determined not to give euphemisms to rivers but to [name them] – the Howqua or whatever. 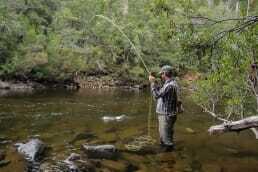 But funnily enough, in 25 years of fishing the Howqua we’ve never run into another fly fisherman. Extraordinary, I know, but maybe we’ve just been really good at picking the right time to go. I think too with more fishermen there are more resources [servicing the sport]. There are a lot more guides working now, and as they say a morning with an experienced fisherman is worth probably a year of trial and error. When I introduced my two eldest kids to fly fishing we went with some nieces and nephews and stayed at Millbrook. Great facility, and Phil [Weigall] was there to teach them. Well, that’s a resource, a better way of getting it done than trial and error with your own kids. FL – Again, though, part of the charm of the series is the fact that you didn’t use guides [TG – “not on camera anyway”]. A DIY approach emphasized the notion of personal accomplishment and made the experience more relatable. Do you think there is a natural progression to guided fishing? RS – I’d rather the solitude of fishing alone but every now and then you need some local knowledge. Also, your skills decay over time [and a guide can help with that]. 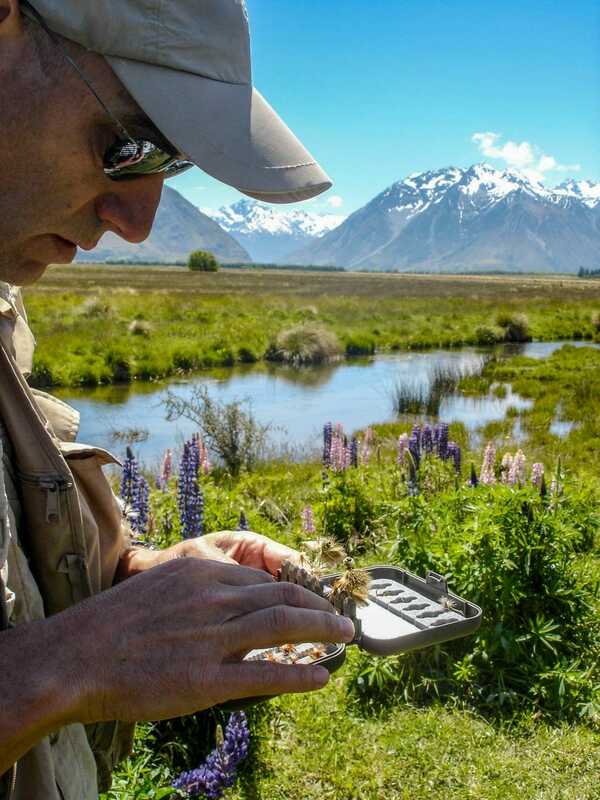 TG – If you’re time-poor, say with three days in New Zealand, for goodness sake, don’t be proud, get a guide, because you’ll have a fantastic couple of days – even if for the last one you’re on your own, trying to apply some of the skills you’ve picked up. If you’ve got three weeks, well then maybe take your time and poke around and enjoy it that way. FL – What about things like magazines and videos and all that? Do you think they have contributed to the popularity of fly fishing? RS – The publishing side of it is very important. We love the fishing magazines – we’re like golfers who don’t have time to play much but still seem to buy all the magazines. We’re blessed with some good ones – FlyLife is a beautifully made magazine. I think all of those adornments to the pursuit are important. You walk into any fisherman’s house and there’s kit, there are magazines and maps and things like that. And of course, travel is now a massive part of both golf and fishing. FL – Good point. When you set out to make A River Somewhere did you see it more as a fishing show or a travel show? RS – I think it was as sort of a “guys’ trip show”. …perhaps the journey was every bit as interesting as the fishing. TG – I don’t think we set out with any predetermined idea, but we realised pretty early in the editing process that we didn’t want to get to the river too quickly, that perhaps the journey was every bit as interesting as the fishing. FL – I think there was more actual fishing – shots of casting and so on – in the Howqua episode than in any subsequent one. TG – That’s true, but as we went on we realised it was more about an interesting train ride or a challenging walk. FL – You made good use of aerial photography to set the scene and promote the travel aspect in many of the episodes. RS – Yes, and all that would have been a lot easier now, with drones and so on. 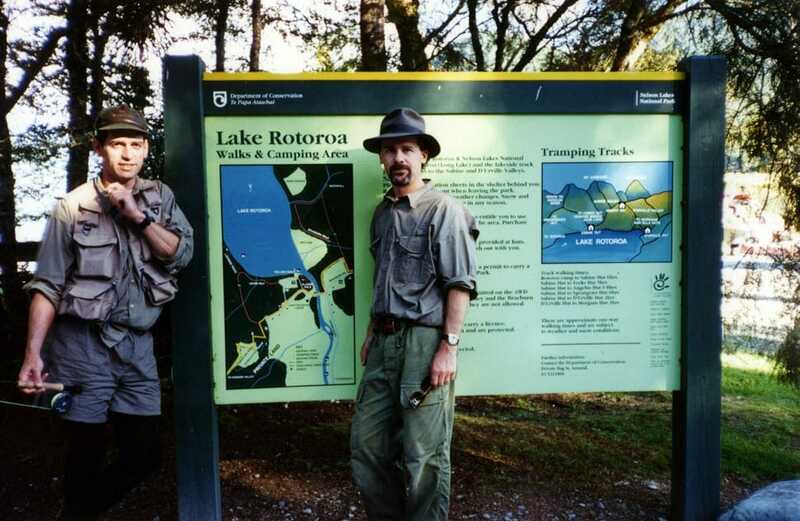 TG – In New Zealand we used a helicopter to get to the river, and also to film, but getting the necessary permits (because it was a national park) and so on was really complicated. The chopper wasn’t supposed to go below a thousand feet but we managed to get a permit to go down to 500 feet, things like that. Now [you could get all that footage] with a little pocket drone in about five minutes. RS – The series was shot on old-fashioned film – Super 16, so very high quality, but heavy cameras, heavy film. [Gear and] logistics were often a pain in the arse, which I guess just proved the old saying “You want to spoil a holiday? Film it.” But the benefits were high. FL – People often have the idea that shows like this are done by magic, but of course you are not alone. How big was the crew? RS – The rule we tried to stick to was that everyone had to fit into one van. The minute you let it get bigger than that you need people to coordinate the people. So cinematographer and sound. We would do most of the direction and planning, in concert with the cinematographer, which meant that the intensity was pretty ridiculous a lot of the time. FL – But it would still be a far cry from all the productions you’ve done since, which would have involved major crew. You must look back on this nostalgically in terms of its commando-style filming. TG – We’ve still kept the philosophy of doing what we do with as few people as is legally and sensibly possible. RS – And for A River Somewhere we didn’t need props people or production designers – it was just us and our rods and the river. FL – These days everyone seems to be making fly fishing films. The technology is so light and high-tech that it’s possible to make almost cinema-grade films using minimal equipment. You must look at now and think, wow, if only we’d had all that then – a drone, a 4K camera that fits into a backpack, all of that sort of stuff. RS – Sure, but it’s funny – after five minutes it still comes back to story-telling. I mean, I’ll watch someone’s Super 8 film if it’s got a good story. FL – Apart from the episode filmed in Italy where you had to resort to visiting a trout farm to provide the requisite parting feast – cue the ashamed German Shepherd – were there other times when you really struggled to catch fish? TG – It seems inevitable that every time you take out a camera the fish tend to go very quiet and certainly there were days where we struggled. RS – With the odd saltwater episode we found that if you were not on the right tide you were dead, and then when it was on, it was so on. Venezuela was like that. That was a stunning place that summed up the whole series. You’d think, how could this place you’d never heard of really be there when we get there, because I’ll bet when we get there [it will be nothing like we’d imagined]. TG – That touches on the fact that this was all pre-internet, so when one of us would say “I heard something about this thing called bonefishing in Venezuela.…” Well, now, of course you’d just open your computer and it would all be there, including booking the trip, but back then we would go into The Compleat Flyfisher and literally come home with a book. Planning was a lot more difficult. RS – You know the best thing about going to Los Roques was that on the plane we got off they were unloading their first espresso machine. Italians had found it before us, and so good coffee arrived literally the day we did. FL – You were very fortunate in finding good allies in the cooking department. I think the only meal you really cooked yourselves was in the Howqua episode, and even then you’d already been given the ingredients and instructions by a local chef. In all the other eps you involved the locals in some way, which gave the story more depth and added a real sense of community. TG – We certainly didn’t profess to be professional fishermen and we one hundred percent didn’t profess to have any great cooking prowess. Again, I think that was just the nature of the series. FL – Of all the species caught which do you remember as providing the best meal or being the best eating? Does one stand out? TG – That’s interesting, because in real life we never take fish, but when we met the guide in Wyoming I remember him saying “Here come the fish killers”. TG – …because we took one! RS – Maybe some fish we caught up on the Reef off north Queensland, coral trout or something [were memorable]. Some of the others, like bonefish, are not even eating fish. TG – The fish we caught at the trout farm in Italy… even though we bought the fish, I think the accompanying meal, with the home-grown veggies and the garden setting and the company [was a really good one]. FL – People love travellers’ tales that involve dilemmas, disagreements and disasters. Any juicy anecdotes from the archives about things that never made it to the screen? TG – We had a guide in Bhutan. Remember his name? TG – Karma. Karma was his name. And he had that beautiful quality that he never wanted to say “no” to anything. So he was organising the next day’s logistics and we said “Karma, are we going fishing tomorrow?” “Yes.” “And we can go down to the river in Paro?” “Yes”. Everything was yes, yes, yes. And we arrived to find it was a holy feast day and we weren’t allowed to fish. You couldn’t get angry because he was such a delightful guy. We took him back over the previous night’s conversation and all he could say was “Oh, sorry Mister Tom”. RS – That reminds me of Calcutta. Now everyone knows about the Bollywood film industry, but we found it very interesting at the time and thought “let’s go see a film” so we introduced ourselves to the cinema owner and he was so gracious, absolutely delightful, and was happy to leave a little light on us watching the movie [so we could be filmed]. And he sat down with us. And five minutes went past, ten minutes went past, twenty minutes went past – and finally, one of us leant around and went “Um, when’s the film going to start?” And he said, “Whenever you would like”. He was waiting on us, and not one complaint from the audience throughout all this. FL – Were any of the trips nightmares, or did they all go pretty smoothly? RS – I reckon there were a few where we got a bit sleep-deprived. I remember once, it might have been between Belize and Wyoming, we did 118 straight hours [without sleep]. TG – Yeah, it could be gruelling. Part of the trick of TV, though, is that everything always look effortless and is constantly fun. But of course you compress and excise large chunks of the day [in the edit]. RS – It’s funny, probably the biggest fishing disaster we’ve had was just last year, or maybe the year before. We were on a little non-descript stream up in the northeast [of Victoria] and almost about to pull out for the day when a submarine took Tom’s fly. If it wasn’t five pounds it was a four-pound brown, the biggest I’ve ever seen up there. “Give me your camera’” I said, and I stood in the middle of the river and I clicked and I went “Oh you’re gonna love that”, and I clicked again, and on the third it fell out of my fingers. It was the most perfect afternoon, sunny, we were just about to go back to the car and have a meal, and I reckon God looked down and said “You know what I could do here…?” So we’ve never had any proof…. TG – Rob “commissioned” a friend of ours to do a sketch of it, though I’m not sure it’s entirely to scale…. …one way fishing has changed for us is that we get on the river later and leave earlier. FL – Here’s another quote: “A lot of people subscribe to the theory that if it’s comfortable it’s not camping.” It’s not a theory we subscribe to. RS – No, no, no, and we’ve doubled down on that since. If it doesn’t involve getting a key to a room it’s not camping for us. TG – We don’t feel like we have to prove anything, and as Rob says, a good meal and a bottle of wine at the of a great day on the river is as much a part of the experience for us as the fishing. It’s a real danger if you’re fishing in places like New Zealand in the summer, when it’s light ‘til after nine o’clock. Of course the fishing often gets better on the evening rise, and you find yourself going “Oh, one more pool, one more pool,” and then find yourself back at the lodge after the kitchen’s closed, eating a packet of chips and drinking a lukewarm Coke. RS – In fact the first time we went out and tested for A River Somewhere that’s exactly what happened. We got back to our hotel, the kitchen’s closed, beer’s about to go off and the whole crew sat around and ate salt & vinegar chips and drank Diet Coke. FL – Given that you both started from a relatively low base of knowledge and skill – which as we’ve discussed proved to be a virtue in the series – have you learned anything in the last twenty years about casting flies, streamcraft, entomology and so on? Do you feel that you’ve become better fishermen? RS – Yeah. And [developed] a better instinct for it. Though I think we still false-cast too much [and probably] spook a lot of fish. 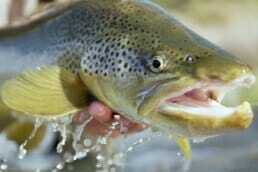 We’re starting to look into other forms of fishing, like spey casting and Czech-nymphing and so on. We’ve just dipped our fingers into tenkara, the Japanese form of fly fishing with a long extendable pole. RS – We haven’t done much lake fishing, that’s probably the biggest gap in our experience. I guess we’ve always been more hooked on exploring up a river, wondering what’s up there. TG – With lakes you can stand on the shore and pretty much see it all in front of you. FL – Where does A River Somewhere sit on your personal scale of accomplishments? Are you sentimental about it or was it in the end just another Working Dog project? I have this theory that guys are at their best when they’re doing something together – driving, whatever. I think if two guys meet over a cup of coffee and have to look at each other they don’t know what to do. But sit them side by side in a car…. TG – They say that’s why PlayStation was invented, so guys could talk to each other…. RS – (laughing) Let’s say we’re always intrigued by the reaction we get to the show. TG – And the depth of affection for it and, even after 20 years, Liam Bradley’s soundtrack. It was a package that has lived on in a way that has delighted us. FL – Do you have a favourite destination, or episode? TG – Maybe the Howqua episode because it’s our home river and was our first episode. RS – I probably love New Zealand as a country as much as Australia – but again, God looks down and gets amused by your plans and gives them a twist. After we did the NZ episode at Nelson Lakes I thought “I’ve gotta go back there.” I went across with my wife and we walked way up this valley, fishing, and I thought “This is the most heavenly place.” We found a hut that fitted thirty but only had one other person in it, and I was thinking “It does not get better than this”[Then at] 3 in the morning the local high school annual camping trip arrived, along with three bow hunters, and filled the place up. 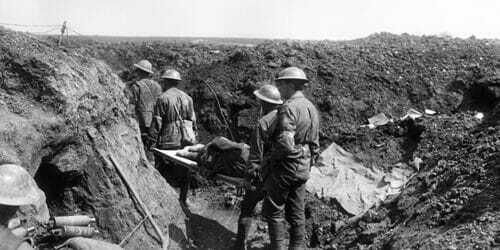 It was the most gruelling night and we pulled the pin the next morning. TG – Another mishap was fishing together in New Zealand. A really big front was heading in and we should have listened to the very wise advice of the chopper pilot, who said “You blokes are gonna get a wet arse.” He was right. We got socked in and were stuck in a hut for three days. RS – Add to that, honestly, the taste we had of bonefishing in Los Roques. You can see why people get hooked on that. It’s got a lot of fly fishing in the mountains about it – it’s sight fishing, it’s a beautiful temperature. If you asked me what I wish I’d done more of, that would be it. FL – Most of the episodes appear as if all the action has happened in the course of one day. Was that indeed the truth or did you have to shoot over a few days? RS – Oh, you have to shoot over multiple days. Early on we thought it would be great to do it in real time, but we soon learned that was not going to work. 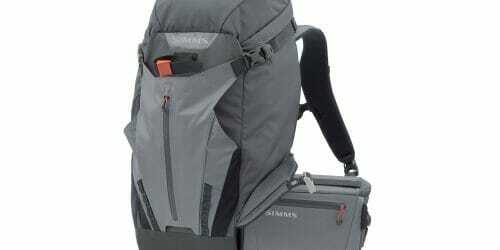 When you’re only using one camera, you have to go back again and again [to get what you need]. TG – We might fish in the morning and then do an afternoon of landscape and general cutaways. Time on the water was not the issue, it was more all the stuff around that, the travel elements. Each episode took about a week, with five days of intensive shooting and a travel day either end. FL – Did you succeed in selling the series in other countries? RS – All of our programs have crept out around the world in different ways – everything from airlines [in-flight programming] to BBC, um, 8. It’s funny, we had just finished a series and made a pact with each other to go on a fishing trip without a camera crew as soon as we could. We hopped on a flight to New Zealand and were sitting up by the bulkhead, which doubled as a movie screen – this was before the days of video consoles in each seat. Not long after we took off they announced “The show we’ve got for you today is an episode of A River Somewhere”. So we had to sit there for half an hour pretending not to be impressed by ourselves. TG – I reckon the other passengers thought we’d requested it, but it was the last thing in the world we wanted to see. FL – For those FlyLife readers who have no idea what this is all about, how can people watch A River Somewhere these days? Is it still available? RS – That’s a good question. DVDs seem to have been superseded these days. TG – Here you go, A River Somewhere, Seasons 1 and 2, on iTunes, $2.99 an episode. FL – Any advice for today’s young fly fishers and/or aspiring film makers? TG – For the former, don’t be intimidated. Fly fishing still has this reputation for being slightly elite and technically difficult, but it’s just not true. Sure, you can start lure fishing within five minutes and it might take a day or two to sort out how to cast a fly. Find someone who knows what they’re doing to teach you. I think it’s well worth taking a casting lesson or two. FL – There are now legions of talented young fly fishing film makers out there producing some great stuff. Do you ever see yourselves returning to the genre? RS – I’d like to say yes. About two years after finishing [the second series] we started saying “we should, we should, we should…” And now 20 years have gone by. In our heads we always meant to go back [and do more episodes] but we haven’t. We’d never rule it out, though. We still go away on trips, exactly like in the show, so in a way we’ve never stopped preparing for another series. FL – So you’re not saying no to another series? RS – No, no. We just haven’t got to it. What’s funny is that the form of our fishing hasn’t changed in the intervening 20 years (laughs). We still go away on trips, exactly like in the show, so in a way we’ve never stopped preparing for another series. FL – Final question. Of the various fishing shows on TV at the moment which ones do you rate? Do you follow any of them? RS – Which is the one where the guy does the extreme fishing? River Monsters? I’ve watched a bit of that. RS – He touches on one of the things we love – and you’re right, Tom, it is a secret fishing show – he’s chasing seafood. TG – Yeah, he can just cook it better than we can. FL – That’s beautifully brought us all the way back around to the fact that this series was really about travel, fishing and cooking.